In the first few months our baby's skin is continually developing, so as well as being as soft, it's also super delicate. Baby's skin is 30% thinner than ours, so it's more vulnerable to damage and dryness and their skin barrier is weaker too, which means baby's skin loses moisture up to five times faster than ours does. That's why the best baby bath soap should give your baby's skin the gentle care it needs. Baby bath products should offer more than just mild cleansing they need to ensure the healthy development of your baby's skin too. Gentler and more nourishing than any other baby soap bar*, Baby Dove Rich Moisture Baby Bar has a hypoallergenic and pH neutral formula that's ophthalmologist, dermatologist and pediatrician tested too. Our Baby Bar replenishes baby's skin with essential nutrients lost during bathing. With a pH neutral formula and enriched with our moisturising cream, our baby bar keeps your baby's skin feeling extra soft and helps prevent the dryness that other ordinary baby soap bars can cause. And with a delicate fragrance, you can simply just enjoy those special bath time moments with your little one, safe in the knowledge that you are giving your little one's skin the care it deserves. *Ordinary soap-based bars without skin-essential nutrients. Buy Now! Explore the entire range of Bath Time available on Nykaa. 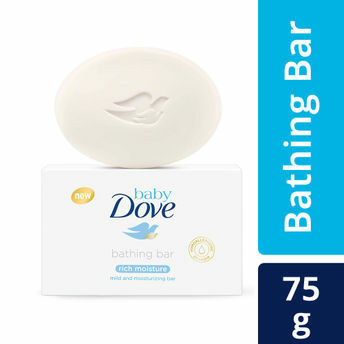 Shop more Dove products here.You can browse through the complete world of Dove Bath Time .